End users and system administrators can use this checklist to obtain authentication values and other connection parameters that are required to authorize a CData data provider to connect to any SAP system. Connection Type: Set this property to the type of the connection you are making to SAP. The CData Data Providers support five different kinds of connections to SAP: Classic, Classic_Unicode, NetWeaver, JCo, and Soap. This article focuses on the Classic and JCo properties. 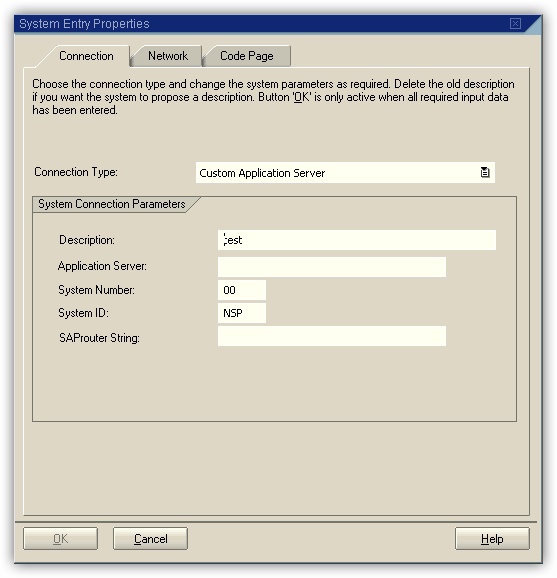 If you are using the JDBC driver to connect to SAP, set the Connection Type property to "JCo". Otherwise, set the Connection Type property to "Classic". Location: Set this property to the full path of the folder where new table schemas will be stored. The user must have read/write permissions to this folder. User: Set this property to the username. Password: Set this property to the password. Client: Set this property to the 3-digit number that identifies the client. Note: To specify the language when you connect with the driver, set the Language connection property to the value in the Language box. For all connection properties, see the Connection String Options chapter. 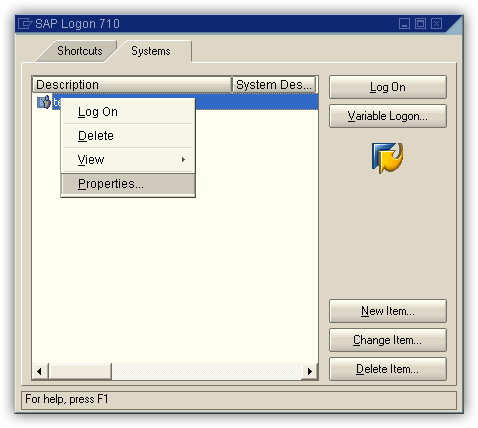 To be authorized to connect to the SAP system, the system administrator will need to provide several additional values that are defined in the System Entry Properties dialog. You can obtain the following connection properties on the Connection tab of the System Entry Properties. System Id: Set this property to the value in the System Id box. The System Id property is the System Id or R3Name of the SAP system. The system Id is a string with a maximum of three characters. It often used in connections to SAP systems with load balancing but may also be used in SAP systems with a dedicated application server. Message Server: Set this property to the value in the Message Server box. If a value is specified in the SAPRouter box, prepend the value in the SAProuter box onto the value for the Message Server connection string property. The Message Server must be specified when connecting to an SAP system using load balancing. 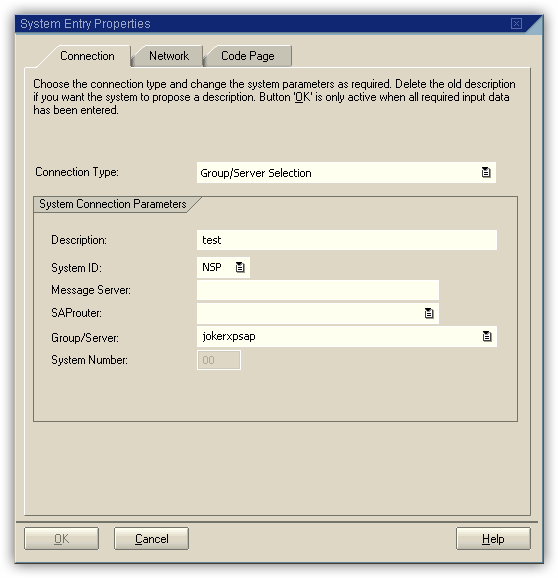 Group: If a value is specified, set this property to the value in the Group/Server box. The Group property specifies the logon group being used. The default in most SAP systems will be PUBLIC. Host: Set this property to the value in the Application Server box. The Host property specifies the host name of the target system. This value can be a regular host name, IP address, or SAPRouter address. System Number: Set this property to the value in the System Number box. The System Number property defines the target system. SNC Mode: If the "Activate Secure Network Connections" checkbox is enabled, set the SNC Mode connection string property to True. If this checkbox is disabled, set the SNC Mode connection property to False. The SNC Mode connection property is a boolean value determining if you are using SNC. The default value is False. SNC Partner Name: Set this property to the value in the SNC Name box. SNC Name: Optional. Set this property to the value in the SNC Name box. The SNC Name property specifies the name of the SNC connection. Set this property to make sure that the correct SNC name is used for the connection. 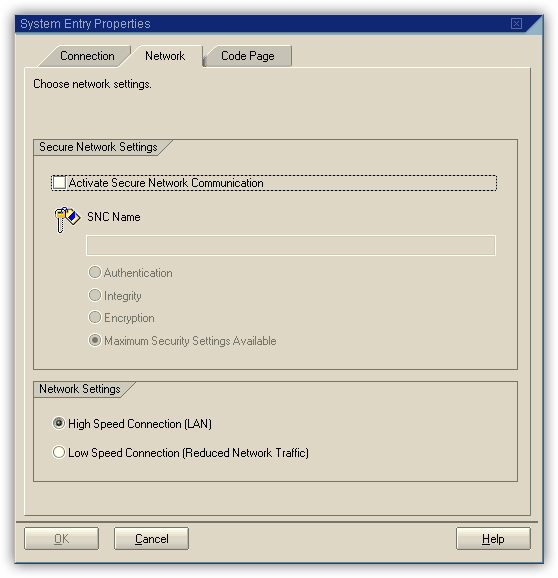 SNC Qop: Set this property to the selected option in the Secure Network Settings section. For example, if the "Integrity" option is selected, set the SNC Qop property to 3. 1: Apply authentication only. The identities of communication partners are verified. 2: Apply integrity protection. The SAP system detects any changes or manipulation of the data exchanged. 3: Apply privacy protection. This level provides integrity and authentication. The SAP system encrypts the messages being transferred. No one but the two communication partners can read or tamper with the data. This is the maximum level of protection. 8: Apply the default protection. 9: Apply the maximum protection. SNC Lib Path: Set this property to the path and filename of your SNC library. The SNC Lib Path property specifies the full path to the security library you are using. For example, C:\Secude\secude.xll. The default value is sapcrypto.dll.